Bi Bim Bap is where you go to eat when you've spent too many nights dining at Cowbell or the Black Hoof . Opened in December, it's the new Korean restaurant found on Eglinton West of Bathurst. Now you might think that Eglinton West is an odd place for a Korean restaurant, as it's far away from the established businesses found in Koreatown , and even further away from the long stretch of Korean restaurants on Yonge Street north of Sheppard. 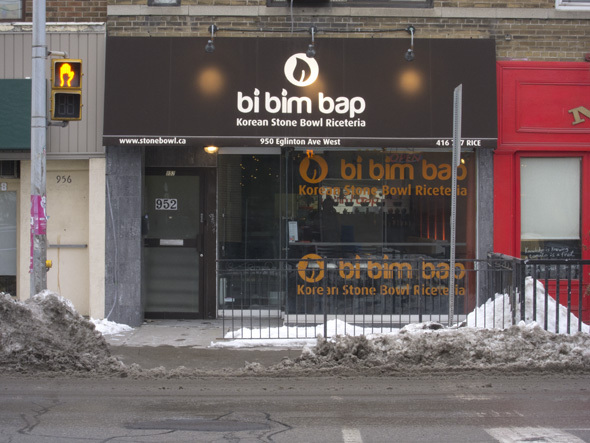 Branded as a "Korean stone bowl riceteria", Bi Bim Bap is also down the street from old Toronto institutions such as House of Chan and China House , but also counts two bagel shops, a Kosher restaurant, a sushi joint, and a Pizza Pizza among its neighbours. It was this diversity of the neighbourhood that appealed to owners Sam Lee and wife Janet Yun. As I chat with Sam, I realize that he loves to eat just as much as I do, and is passionate about serving good food to his customers. His philosophy is, "If I don't like it, I won't use it." While developing their menu, Sam and Janet consulted traditional Korean recipes for authenticity, and then thought of how to interpret them in a Canadian way. Then they figured out how to keep everything heathy. It's a tricky triple-threat combo, but I really believe that they've nailed down all three. 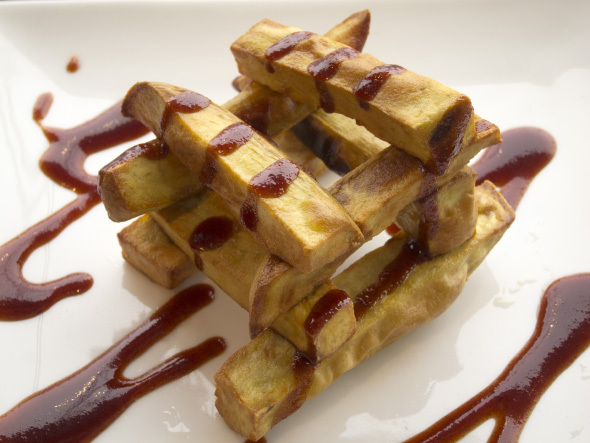 Sweet Potato with Sweet Go Chu Jang Sauce ($2.99) is a stacked tower of lightly fried Korean sweet potato. The Go Chu Jang is made from cooked apples, chili flakes, and rice flour; it tastes like what would happen if an apple and some BBQ sauce got together and had a party with the hottest people. The outside edges of the wedges are crispy, the insides are lightly fluffy, and I demolish the tower quickly. 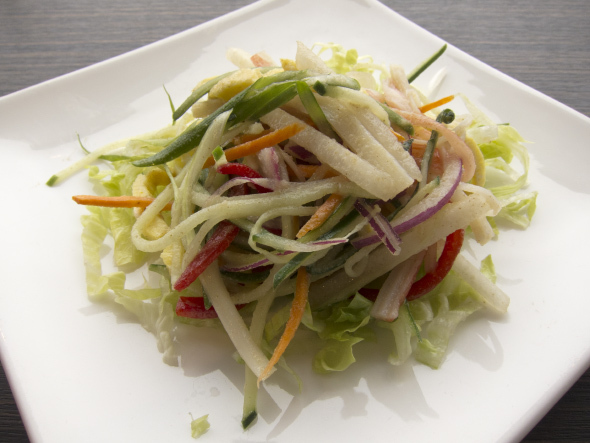 Crunchy Wasabi Salad ($3.99) is for wasabi lovers. Made from julienned cucumber, carrot, red onion, sweet peppers, green onion, apple, egg, and imitation crab (which can be subbed out), it's dressed with the kind of wasabi vinaigrette that shoots fire up my nose with every bite. No wimpy, artificially green, pasty stuff here. Bi Bim Bap currently has five versions of its namesake dish on the menu. Sam specifically instructs his kitchen staff not to have any rice showing, so that there is a balanced rice-to-topping ratio. All of the bibimbap come with a base topping of Korean radish, spinach, bean sprout, carrot, cucumber, burdock, sweet potato stem, striped zucchini, shitake mushroom, dried seaweed, and sesame seeds. After your mind is blown, you get to choose the protein. Really, I'm just happy to be able to request brown rice. The Traditional ($8.99) comes sizzling with strips of sirloin and a fried egg. 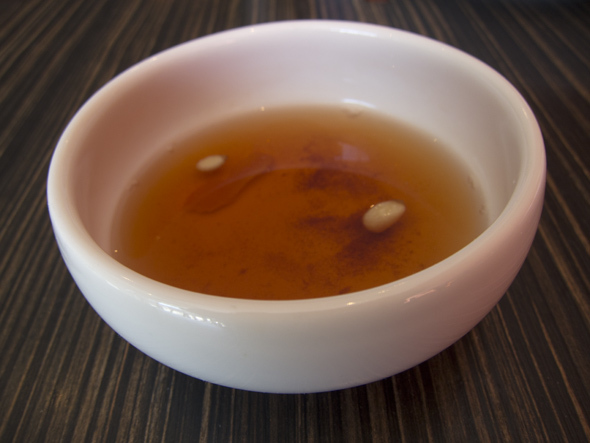 After breaking the runny yolk with my chopsticks, I drizzle in some Original Go Chu Jang and go stir-crazy. I eat the colourful mix with the supplied spoon, and it's another lovely party of flavours; where the slightly crispy rice is coated with egg yolk and sauce, the vegetables provide various textures, and the strips of sirloin are cooked just enough to still be beefy. 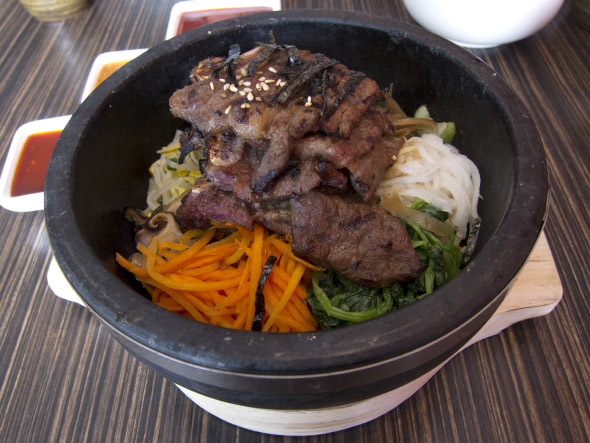 The Kalbi ($14.99) is a meat lover's dream. The succulent pieces of marinated short ribs are so tender, and there's no gristle to be found. I try it with the Suicide Go Chu Jang, and the chili fire tickles the back of my throat before bursting into flames. 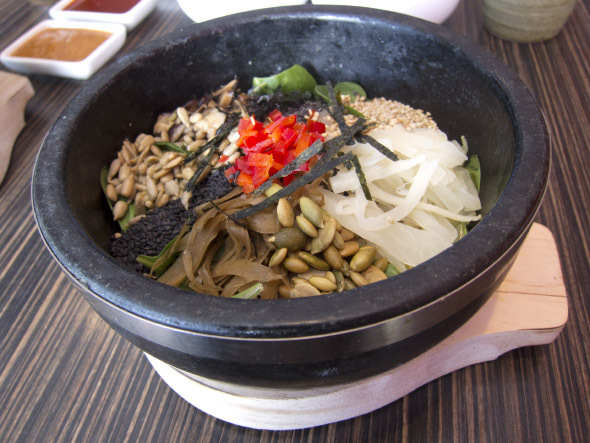 The special Seed Bibimbap ($10.99) is a vegan's dream. Black and white sesame seeds, sunflower seeds, pumpkin seeds, and poppy seeds turn into confetti when mixed into the rice. Add crunchy vegetables, chewy mushrooms, and earthy Sesame Bean Go Chu Jang, and I honestly don't miss the meat. Homemade kimchi (made without shellfish!) and miso soup are simple but perfectly made sides. The cold cinnamon-ginger drink helps me digest, and is a lightly sweet ending to all the awesome Korean food. Bi Bim Bap is open Tuesdays to Saturdays from 11 am to 10 pm, and Sunday 11 am to 8 pm. Closed Mondays and holidays.